Although there is a little bit of the philosopher in every angler, few get into print on the subject and fewer still write well, so a new book on the subject from Mr. Schwab is assured of a welcome. If you have read his previous work, Hook, Line and Thinker you will appreciate his off-beat and discursive style and I am pleased to say that if anything, Alex’s singular approach to writing is getting more pronounced. The book begins with an email from a young friend asking for ideas to help write an essay entitled ‘What’s good about fishing?’ and then moves in very short order to the Lobster public house in Waterville. A page later we are angling on Lake Thun in Switzerland and just before the author gets us completely lost, dispersed in the fertile vistas of his mind’s eye, he (somewhat reluctantly) drags us back to a systematic list of the arguments for angling, highlighted with eye-smartingly scarlet titles. After a brief demolition job on the Roslin Institute’s intellectually wanting paper on whether fish feel pain, we are off to Lough Currane to fish for salmon with Michael and to reflect on the dangers of moral relativism, a topic which Jon and I discuss often, and on which the office bluebottle contributes little, chiefly because it is still dead. 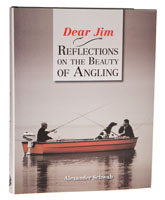 Just in case you think that Reflections on the Beauty of Angling is too stodgy to be a good read, let me reassure you that it is completely off the wall and there really isn't anything like it, except for other books written by the same author. Great book if you are in the mood, probably not a good one for your blood pressure if you are a dedicated field sports activist.